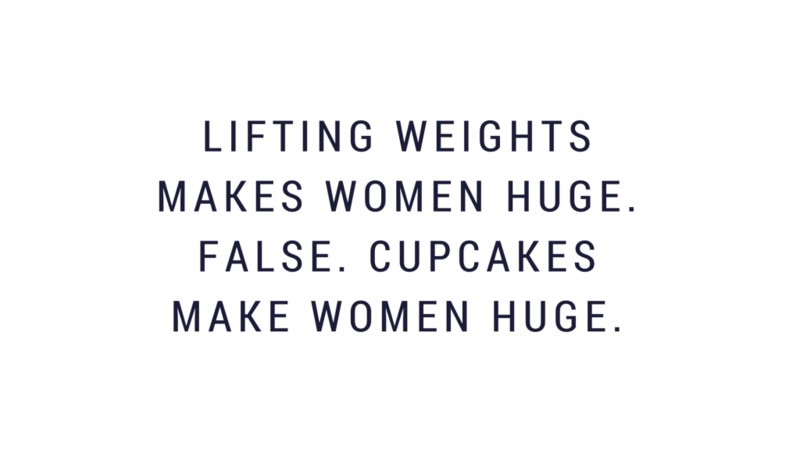 Today we are talking about Women’s Weight Training. Each month, we update our waiting area with the newest edition of Women’s Health and each copy is the same – littered with half naked (photo-shopped) women endorsing quick fixes they’ve never tried. 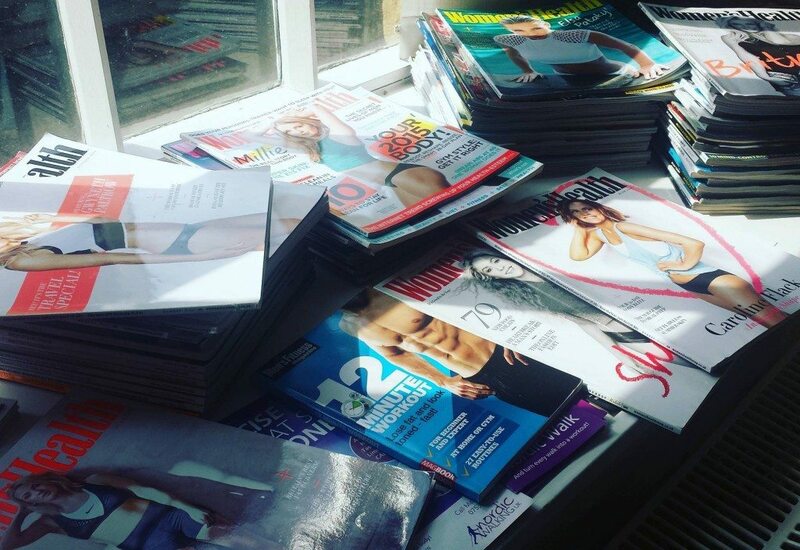 Like many magazines geared towards a female readership, it is common to find adverts promising instant weight loss in only a few simple steps. This has to be one of the biggest misconceptions in our industry. As a result, we find female clients sticking to the 3kg dumbbell curls, never swinging more than a 6kg kettlebell and looking weary at the prospect of squatting an 8kg bar. But, functionally, this is silly… Right? It’s not like ladies ever have to carry shopping bags, lift our children or do the gardening… You get the message. Basically, this myth puts a lot of women off using weights, looking at weights or generally being in the same vicinity of weights. As very experienced fitness professionals, we are telling you that lifting weights makes you stronger, not necessarily bigger. Of course, there are athletes who train for competitions to look both bigger and stronger, but trust us (Sarah will back me up on this one!) this approach to training takes A LOT of dedication, hard work, specially designed training plans and a strict diet. Just take a read of Sarah’s latest blog about her training and prep for UK Bodybuilding and Fitness Federation 2016. It’s not going to happen to you if you do 45 minutes weight training every other day. Honestly. Lifting weights regularly and ‘eating right’ (in other words: feeding your body with enough calories of the good stuff) will make your muscles denser, it will burn the fat that surrounds them and will ultimately leave you looking toned. It will get you closer to the body shapes you admire on the celebrities posing on the front cover of Women’s Health (each whom have their own Personal Trainer using programmes that utilise weights). Strength training is not only about toning up. It is an extremely effective way of losing body fat. Scientifically (cue the lab coat and Bunsen burner), when we lift heavy weights our muscles tear and fibres break down. Over the next 24 hours or so, our bodies dedicate energy into repairing and rebuilding them (this is where protein rich diets come in – speeding up the process). In order to repair muscles and crack on with all the other things our day is typically filled with, our body requires energy. And where does it get it? From the calories you’ve been eating. This causes your metabolism to operate at a faster level, even when your workout is long done and finished. I hope that I have managed to convince you that women’s weight training is SO worth it. You might be thinking at this point… “Yes, sounds great, but now what?” It’s extremely important for anybody using weights to a) make sure you are using them correctly (not only because of potential injuries but so you can get the most out of every rep) and b) make sure that you are motivated to stick at a programme long enough to reap the rewards (it’s never a quick fix when you do something properly!). This summer, we have decided to extend our Men’s Muscle Up Programme to women (after all, it’s no good us rambling on about the benefits of women’s weight training and then not giving our ladies the chance to shine!). 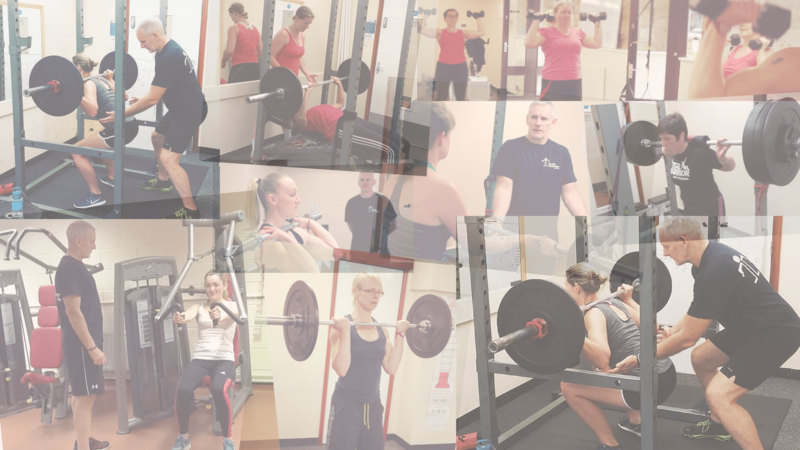 This is the first time we have provided a women’s weight training course (but you can check out the men’s success stories here). It will be an 8 week programme consisting of intense, dedicated and rewarding Personal Training in the company of an industry expert. If you are serious about increasing your muscle to fat ratio, would like to burn more calories by enhancing your metabolism, look slimmer, tone up, increase your confidence, gain strength, enhance your knowledge/understanding about appropriate training for you and your body, and ultimately change your life, get in touch. It might not be for you, but you’ll never know if you don’t try.